Narendra Modi’s Swachh Bharat Abhiyan / Clean India Mission TRUTH. Dusty lanes, unsealed gutters, lack of sanitation and hygiene and of course, the ever growing garbage appears to be a very big issue in India. To solve the issue, on 2nd October 2014 our Honorable PM Mr Narendra Modi launched the country’s biggest ever cleanliness movement “Swachh Bharat Abhiyan” from Rajpath. Same day, at 2:07 pm IST he has tweeted @narendramodi: “My faith is in the people of India. I am confident we will devote our time & energies and make this Mission a success”. Its almost 3 month now, Let’s check the impact of his words on the people of this great country, INDIA. Please check the SHOCKING VIDEO below, This video clip is a PUNCH on Everybody’s face who demands a ‘Swachh Bharat’ but effortlessly neglecting their role in it. Intelligent one’s will definitely learn a lesson from it. I salute the team of “NisheethTV” for showcasing the hypocrisy of Indians. This video clip is a much required slap on our faces. People are breaking the rules themselves BUT the most shocking part is when they are giving fake / confident speeches to show their full support for this “Swachh Bharat Abhiyan” :-). It was alarming plus the TRUTH / REALITY to see what these bunch of people was doing a couple of mins before the cams begun rolling. It is not just shocking, but terrible to see such ignorance and carelessness on our role as citizens of India. If we cannot stop urinating and littering in public, we do not honestly deserve a “Swachh Bharat” because change starts with your own self. I don’t have any complaint with our respected Prime Minister Mr. Narendra Modi. Its good to see that there is somebody in this country who has this “out of box” thinking but feeling disappointed with the thinking of the average people’s in this country about this serious issue. They don’t even know that less than one-third of India’s 1.2 billion people have access to sanitation facility and due to this more than 186,000 children below 5 expire every year from diarrhoeal diseases caused by harmful water and very poor sanitation, according to the charitable organisation “WaterAid”. A United Nations report in May said 1 / 2 of India’s population still undertake open defecation, setting them at chances of diarrhoea, cholera, dysentery, typhoid and hepatitis A. The causing diseases and deaths result in major economic losses, and a World Bank report in 2006 predicted that India was dropping 6.4 percent of GDP yearly simply because of poor access to sanitation. Stop blaming our government for each and every happening, The Govt already had announced Rs 20 lakh per year for every village panchayat for “Clean India Campaign”. Its now our duty to take this seriously and do the maximum to lift the spirits. This “Clean India Mission” is projected to cost a whooping Rs. 62,000 crore and is supposed to touch out to 4,000 towns over the next five years. The goal is to accomplish a ‘Clean India’ by 2019, coinciding with the year that India will commemorate Mahatma Gandhi’s 150th birthday anniversary. 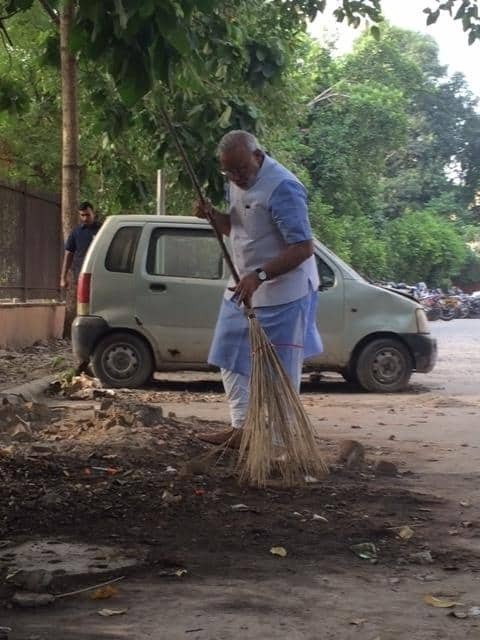 Please, Please and Please Support our PM Mr Narendra Modi with this “Swachh Bharat” Campaign. Next Generation of this country will definitely going to remember you for this kind support of your’s. God Bless, I love INDIA. You may also like: How Much Educated Indian Politicians Are ? You will be Surprised !